Daphnia are one of the finest and most universally accepted live foods for most fish. Many fish species can be kept in excellent physical condition by feeding live daphnia to them several times per week. Daphnia are extremely effective at bringing many fish into spawning condition. This is especially true for cyprinids (carps and minnows) like goldfish, barbs, danios, etc. Daphnia can be cultured in just about any container that holds water and is non-toxic. Ideally, aquariums should be used, especially for the beginner since you can keep better track visually on the culture’s progress, how much to feed, etc. Once you gain experience, other containers may be used such as Rubbermaid tubs or trash cans. The minimum size container recommended is 20 gallons although small quantities may be reared in smaller tanks. Daphnia prefer cool water. Temperatures between 65 and 70 degrees are about ideal. So it is best to culture daphnia in your basement or other cool locations around your house. At temperatures above 75 degrees, Daphnia magna begins to slow in production. Cultures will survive at warmer temperatures but do not expect much from them during warmest months of summer. My experiments have indicated that chlorella algae and the active baker’s yeast to be the easiest and most effective feeds to work with when culturing. The split pea soup and whole wheat and soy flour feeds are mixed with powdered paprika (about one part paprika to ten parts soup mix or flour). The paprika is used as a color enhancer for you fish. I have worked out a generalized quantity of feed for daphnia cultures. This quantity is listed in the following chart. There are two ways you can feed daphnia cultures. One is a visual judgment of water clarity and is described below. The second is to monitor daphnia densities by using a test tube or cuvette attached to a wooden dowel rod. Randomly sample the culture multiple times at various depths and get an average count of the number of daphnia per milliliter. Use the above table as a guideline for how much to feed. You may need to make your own chart depending on the type of food you are feeding. The above table gives a good starting point. Match the average density of daphnia to the size of tank used and feed an appropriate amount of feed. I believe the above, monitoring density and using the chart method, is better for beginners. This is crucial. Starting daphnia cultures it is very easy to overfeed because you do not have the bio-mass of animals to utilize the feed added to the tank. The uneaten food rots, produces too much bacteria and fouls the water eventually causing a collapse and loss of the colony. Note: if you get a starter culture of daphnia from a fish auction they are usually in a fish bag. Adding this bag to a 20 gallon tank you are going to have far fewer than 1 daphnia per 20 ml sample. So, you need to feed a very small quantity probably like a pinch per day. Only when the daphnia have reproduced to some detectable level between 0 and 1 daphnia per 20 ml do you dare to increase the feed to 1/8 teaspoon or so. The ideal level to feed the daphnia should be enough to cloud the tank up to slightly noticeable opacity. One day later, that same water should be crystal clear. If the water clears up sooner than one day, too little is fed. If the water is still very cloudy the next day too much has been fed. So adjust quantities accordingly. Regular water changes need to be performed on daphnia tanks as well as fish tanks. The bare minimum that a daphnia tank, at full production, should be changed is two 25% water changes per week. If water changes are done more frequent than this, it is possible to see an increase in production. Water changes on daphnia tanks can be performed by siphoning water using a fine screen to cover the intake end of the siphon. Be sure to shake off any daphnia adhering to this screen before the screen is withdrawn from the tank. Alternately, you may combine the water change with harvesting by siphoning off the tank into a very fine mesh screen or net. Feeding the daphnia collected during the water change to your fish. Aged, dechlorinated tap water is needed for daphnia cultures just like for fish. Chlorine will be rapidly lethal to daphnia so you must dechlorinate or age tap water before it is used on the daphnia culture. Selective harvesting of daphnia can be done with a course meshed fish net. Using a course mesh will allow the youngest daphnia to escape for further growth while entrapping full grown daphnia. All daphnia tanks should be at maximum standing drop (10+ daphnia per 20 ml) within several weeks of starting the culture. Daphnia tanks not reaching standing crop must be closely inspected for flatworms, hydra, or other pests. If infested the culture must be discarded, and the container disinfected and cleaned to eliminate the pest. Daphnia cultures should not be harvested until they reach a minimum average density of 10 daphnia per 20 ml. Daphnia should not be harvested at a rate that decreases their numbers below 10 daphnia per 20 ml. In other words, do not harvest more than what would decrease the total average numbers below 10 daphnia per 20 ml. There should always be at least 10 daphnia per 20 ml. Higher numbers should be attained before harvest, only slightly lower after harvest. Periodically, daphnia culture tanks, especially ones at full production, will need to be cleaned more thoroughly. If the walls of the tank become covered with debris, this can be scraped off. If excessive debris accumulates on the bottom of the tank, this can be siphoned off into a bucket. Allow the debris to settle, then pour the daphnia from above the debris back into the tank and discard the debris. If excess debris is not cleaned out eventually the daphnia will suffer “fouling” of their antennules and thoracic legs (swimming and feeding limbs) and this situation must be corrected. This is easily observed as “junk”, debris and spider-web like filaments trailing below the daphnia as it swims. I assume this “junk” prevents the daphnia from properly feeding or perhaps molting its exoskeleton. So it’s very necessary to correct this situation in order for the culture to thrive. Snails should be present in every daphnia culture to clean up uneaten, settled food particles. If snails become overabundant they need to be harvested and fed off to snail eating fish. Alternately, some daphnia cultures come with small oligochaete worms (like Dero digitata) with them. These perform the same job as the snails, and can be harvested to feed the fish too. It is even possible to culture California blackworms (Lumbriculus variegatus) or perhaps tubifex worms in the bottom of daphnia culture tanks. If this is done it may be necessary to feed the cultures at a slightly higher rate to be assured enough food makes it to the bottom for the worms. Airstones in all daphnia tanks should be running pretty good. Airstones running hard enough to constantly stir and swirl all the daphnia through the water is appropriate. Daphnia must not be collecting or grouping up near the water surface or close to lights, etc. If they are doing this there is not enough water aeration. Strong aeration is necessary to keep the daphnia feed in suspension. I have seen some reasonably successful daphnia cultures with very little aeration. However, to achieve the yields listed below adequate aeration is a must. Remember that microscopic food particles need to be kept in suspension for the daphnia to feed. If the food is settling before the daphnia can eat it, you are only feeding your snails or worms. Following the above instructions it is possible to produce 4 to 5 ounces (wet weight) of daphnia per 40 gallons of daphnia culture per week. Therefore, if you go through about one pound of frozen brine shrimp per month, you could simply substitute a 40 gallon culture of daphnia to produce the food needed to supplement your fish. I have been a fish hobbyist for about 35 years and a professional fish biologist for 27 years. During many of these years I have had the opportunity to raise daphnia in containers ranging from 2 liter soda pop bottles up to 1,200 gallon vats. The above instructions will not guarantee you will have success with daphnia culturing but should go a long way to getting you started. Here I will share other secrets to success. In 1992 I conducted an experiment to determine the best and most cost efficient feed to raise daphnia. This study was inspired by the sudden lack of a very good daphnia feed many hobbyists used in the 1970s through 1980s. Many hobbyists are familiar with Jim Langhammer’s successful daphnia culture methods using “split pea and ham soup mix” fed alternately with baker’s dried yeast. According to Jim Langhammer, the yeast seems to make the daphnia reproduce quickly, while the split pea and ham soup mix made the daphnia grow big and robust. The ham chunks in the split pea and ham soup mix served as food for tiny Dero digitata worms that shared the daphnia cultures. The dehydrated ham chunks would eventually sink to the bottom of the tank and the Dero digitata worms clustered and fed on the decomposing ham. These tiny worms, like miniature tubifex worms, are also a great food to feed small fish. This system worked very well for Jim Langhammer and I when first culturing daphnia. The split pea and ham soup mix could be purchased from bulk food stores. Sometime in the late 1980s to the early 1990s the split pea and ham soup mix suddenly became unavailable. Bulk food stores that carried it no longer did. So, I had to find a good substitute. Doing literature searches on daphnia culture you come up with a bewildering array of ways daphnia can be cultured in the laboratory, primarily for toxicology studies. Everything from manure, yeast, live phytoplankton (micro-algae), finely ground trout chow, alfalfa meal, to snail manure (from apple snails), to soy flour and other finely ground foods have been cited as foods for daphnia. Often, some of these items don’t serve directly as food for the daphnia, but the microorganisms like fungi, yeast, bacteria, and protists that grow in the water and are feeding on these items as they decompose is what serves as food for the daphnia. The critical component to using decomposing organic matter as food for daphnia is quantity. If too much is fed, the decomposing matter grows too much bacteria, causing the water to become too cloudy with ensuing water quality problems. IT IS VERY EASY TO OVER-FEED DAPHNIA CULTURES CAUSING CATASTROPHIC COLLAPSE OF THE COLONY. Not sure what kills the daphnia but it could be depleted oxygen, high ammonia, high nitrites, high nitrates or high phosphates. Something kills them off if overfed. Literature searching on water parameters that daphnia are sensitive to you find that they are fairly tolerant of ammonia, intolerant of nitrites, somewhat tolerant of nitrates, and have an interesting relationship with phosphorus. It turns out that daphnia use phosphorus as an environmental cue to reproduce or not. In nature, daphnia reproduce most rapidly when algae (phytoplankton) are rapidly growing since micro-algae (phytoplankton) are the usual food for daphnia in lakes and ponds. When algae is rapidly growing and is at a high density, phosphorus in the water is usually low, because the algae are rapidly using this up as a food source. So daphnia reproduction is linked to phosphorus levels. High phosphorus indicates to the daphnia’s physiology there is no food (i.e. algae) in the water and cease reproduction. Low phosphorus level indicates to the daphnia’s physiology there should be high algae levels so kick reproduction into high gear. This is one of the reasons water changes are very critical to daphnia culture success! Daphnia sensitivity to nitrites may be the explanation why cultures often fail roughly one to three weeks post initiation. This is just about the right amount of time for the nitrogen cycle to proceed from a high ammonia level to high nitrites. So, daphnia also need biological filtration just as a fish tank does. This is one of the reasons why I advocate using many snails or other aquatic organisms to consume uneaten food. Uneaten food as it decomposes contributes to the ammonia and subsequent nitrite spike. The more quickly this food is assimilated into body mass the less nitrite will end up in the water. Snail shells would also serve as a living bio-media for nitrifying bacteria to convert the ammonia to nitrites and later to nitrates. You can’t have a sponge filter or under-gravel filter in a daphnia tank since this media will trap daphnia food before they get a chance to eat it. Therefore you need some other substrate in the tank to serve as biologically active media. Hence snails, in my opinion, are a quick way to solve this problem on several levels. Snails eat and assimilate some of the uneaten food and their shells serve as bio-media for nitrifying bacteria. I repeat this twice because it’s critical. When you have daphnia in a closed environment it is very easy for phosphorus levels to climb quickly especially when you have a high standing crop, and since you are adding quantities of food. All biological materials contain phosphorus so each time you add daphnia feed to the tank you are increasing phosphorus levels and effectively shutting off their reproduction. Therefore, water changes are necessary to flush away excess dissolved phosphorus. The water changes also diminish nitrites and nitrates which also are detrimental to their welfare. This is extremely crucial when you get a daphnia culture really going in the “maximum standing crop” mode discussed in the first part of this paper. If you do not harvest daphnia, at the same time you do a water change, several times per week, daphnia numbers can quickly plummet and reproduction can be shut down. Think of this mantra……feed, feed, water change, harvest……feed, feed, water change, harvest. If you stick to a schedule like this you will successfully keep daphnia. If you feed, feed, feed, forget the water change, forget to harvest …. your daphnia culture will most likely crash. If you forget to feed, forget to water change, you will never have enough daphnia to make it worthwhile. Close observations of your daphnia are also necessary for success. This is why I advocate using aquariums for the beginner daphnia culturist. If any daphnia predators, such as planaria flatworms like Dugesia get into the culture they will eat away the profitability of your operation. Likewise hydra will wreak havoc too. Close observations of the glass walls of your culture aquarium will tell you if flatworms or hydra are present. If they are it is best you start over again with clean aquaria and new daphnia. If you must use daphnia from the contaminated colony be sure to carefully net out only a small number of “colonists” to start the new colony in order to avoid capturing any hydra or planaria with them. Do not just scoop a bunch of debris and daphnia from the contaminated tank as the debris will likely harbor flatworms, hydra, or resting eggs or cysts of these pests. Be sure to isolate only pure daphnia to go to the new culture. Daphnia can get parasites. More than one time, some of my daphnia cultures became contaminated with a micro-sporidean type parasite. These will cause the daphnia to decrease reproduction. Most importantly, this disease will make the daphnia very opaque, or unusually white colored. When you see a large number of daphnia becoming extremely white and opaque, it is best to destroy the colony and start over again. Close observation of your daphnia will give you more clues to how the population is doing. Remember you are managing a population and therefore you need to know something about demographics in order for your colony to thrive. If you see nothing but small, young daphnia, in your culture, you may be over-harvesting or it’s a freshly formed colony just coming into good production. If most of the daphnia are large behemoths then you are probably under-harvesting, or your culture has not been reproducing well so you need to adjust accordingly. Daphnia typically only live about 21 to 28 days before they die (at room temperature and in a rapidly growing colony) so plan accordingly. If you see mostly big daphnia a large portion of these should be culled out and fed to your larger fish before they perish, thereby making room for younger animals in the colony. Ideally, a thriving colony should have a healthy mixture of all ages of animals. Plenty of newly born young with a large number of sub-adults and a reasonable number of big old adults all should be represented in the population. If you see any one age class over-represented it may indicate a change in management plans is necessary. Daphnia will give you other clues to how they are doing. Normally, under ideal conditions, all daphnia are females and reproduce by parthenogenesis. That is, their eggs develop without being fertilized by a male. These eggs all develop directly into tiny female daphnia that are born from the mother. When daphnia colonies become “stressed” by poor water conditions, improper or not enough food, high temperatures, low temperatures, etc. the all female population will start to produce some tiny males. These males then mate with the females and the resulting eggs that are formed are “resting eggs”. These eggs are very different from the normal eggs. The resting eggs form an “ephippium” or saddle on the mother daphnias’ backs. This saddle is a dark brown or blackish “case” carried on the back of the female and is readily visible to the naked eye with close observation. If you see these ephippium forming on daphnia in your colony, it is a clear indication something needs to be changed quickly. Either water changes, more feed, heavy harvesting, etc. Something needs to be corrected before your colony collapses. These resting eggs are designed to survive harsh conditions such as winter freezing, summer hot and dry periods where the pond completely dries up, or periods where there is no food. So if you see these forming it is a clear indication your daphnia think it’s time to aestivate and you must convince them that conditions are improving enough for them to pull out of this reproductive mode. Remember……feed, feed, water change, harvest……feed, feed, water-change, harvest. So, back to my experiment mentioned previously. In 1992 I set up a replicated experiment to determine the best daphnia feeds to be substituted for the old split pea ham and soup mix alternately fed with bakers dried yeast. I used twenty one two liter soda pop bottles set up on an aeration manifold (each bottle had an air-stem bubbling in it). Each bottle was randomly assigned to one of seven diets. Each diet had three replicate bottles. Each pop bottle received an equal number of daphnia (n=20) and snails (Seminole red rams-horn snails – Planorbella duryi) scavengers at the beginning of the experiment. Each container was fed an equal weight (determined volumetrically since all the foods had very similar densities) of food that was assigned to it. (In the end I compensated for slightly different densities by knowing the total weight of food as calculated from the density and volume of food fed. Therefore the cost of production per daphnia is compensated to the right weight of food.) I monitored daphnia densities in each container and harvested and hand counted all daphnia pulled from the bottles and recorded this over a 44 day period. Data was recorded and graphed as population densities and numbers of daphnia harvested. Red Star brand bakers active dry yeast – $1.40/lb. Ocean Star International brand dried spirulina algae powder – $16.00 /lb. Now brand dried chlorella algae powder – $35.80/lb. Ground split peas and paprika mixture (10:1 ratio) – $2.26/lb. Diet #6 – combination of bakers active dried yeast, dried spirulina algae and dried chlorella algae yielded the best performance. Diet 6 produced more daphnia by 32 days (n=5,240) and by 44 days (n=9,650) than any other diet. It also produced daphnia more consistently with 13 harvests. It produced the first harvest within 14 days. Overall cost was $1.36 to produce 100,000 daphnia. Diet #7 – dried ground split peas, paprika, dried spirulina and dried chlorella algae was the second best in performance. It produced the second greatest number of daphnia after 44 days (n=6,254) and the third best at 32 days (n=3,236). Had the second most number of harvests (n=11). This diet really performed well with rapidity of harvest – like diet 6 within 14 days. The cost to produce 100,000 daphnia was $2.22. Diet #3 – just dried chlorella algae was ranked third. Third in total production at 44 days (n=4,857) and second best in production at the 32 days (n=3,396) and third at total number of harvests (n=9). It was also ranked third at producing a harvest quickly-at 19 days rather than 14 days for the above two diets. Overall cost was $4.54 to produce 100,000 daphnia. Diet #2 – just dried spirulina algae ranked fourth. This diet only produced three harvests and it took 39 days to reach harvest densities. A total of 3,801 daphnia were produced after 44 days. Cost was $1.79 to produce 100,000 daphnia. Diet #4 – dried, ground split peas and paprika ranked fifth. This diet, like spirulina, only produced three harvests and took 29 days to reach harvest densities. It cost $1.71 to produce 100,000 daphnia. Diet #5 – dried ground split peas and paprika and bakers active dried yeast. This diet also faired poorly and was similar to yeast alone. Harvests occurred only after 36 days and amounted to only 2,955 individuals. However, cost per daphnia is relatively low at $.30 per 100,000 daphnia. Diet #1 – strictly bakers active dried yeast cultures did poorly. Although their densities did increase initially up to 10 days post start of the experiment, after 15 days densities remained consistently low and only 2,676 daphnia were harvested at the end of the 44 day period with the first low number harvest (n=846) after 39 days. However, cost to produce 100,000 daphnia was the lowest at $.22 per 100,000 daphnia. 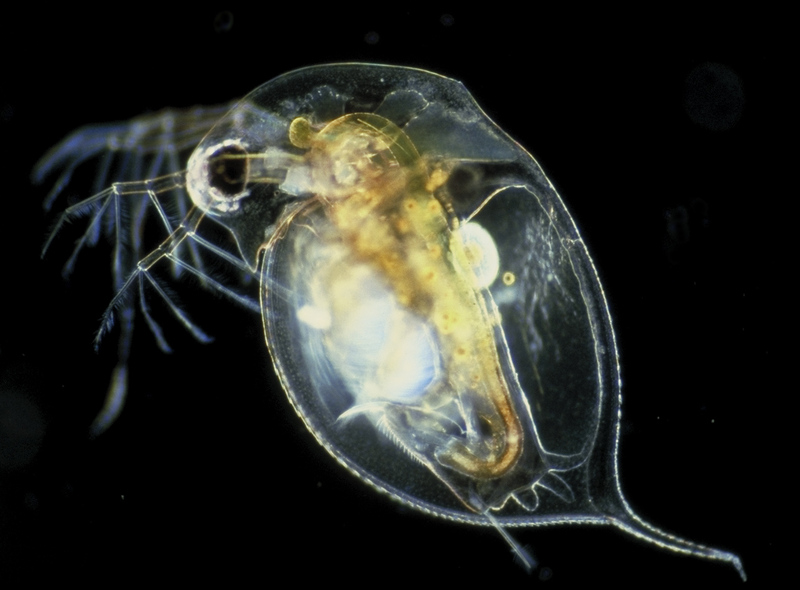 Mixtures of daphnia feed containing whole spray dried algae outperform other types of feeds when it comes to quantities and rapidity which daphnia populations grow. Mixtures of both spirulina and chlorella algae added to either baker’s active dried yeast or ground dried split peas and paprika both performed very well. Any time a dried algae product is used it adds considerable cost to daphnia production. However, using a mixture of high cost algae combined with very low cost yeast or split peas gives rapid yields, with high harvests, at a medium cost to the hobbyist. Using only a dried algae product (either chlorella or spirulina) gives relatively high to medium yields at a slightly longer period than the above mentioned mixtures. However, the high cost of these products ends up making the cost per daphnia produced much higher compared to other mixtures and the cheaper single source feeds. Dried ground split peas and paprika ranked only mediocre. It produced only a modest number of daphnia at a prolonged period and cost was also medium at $1.71 per 100,000 daphnia. Dried ground split peas and paprika added to bakers active dry yeast and bakers active dried yeast alone did produce daphnia. However, production was much slower (by a factor of 3.7 X) than when using dried algae products. Even though production was slow, and low, the cost per unit was also low at only $.30 to $.22 per 100,000 daphnia respectively. Algae (microplankton or phytoplankton) are the natural diet of daphnia in their wild habitat. Therefore it stands to reason that daphnia should perform (grow and reproduce) well fed on dried algae products. However, other feed items have traditionally proven to be effective at rearing daphnia in captive situations. Feed items like bakers active dry yeast and other plant products like dried and ground split peas will serve as feed as well. These later products, although not natural to daphnia habitats, will support daphnia production at a much reduced cost. However, production is much slower and lower yielding than when dried algae products are used. Just as with feeding any animal, variety, like mixing several different feed items, offers better nutrition and compensates for deficiencies that any one item may present. In this study, it was demonstrated that a mixture of both natural type feeds (like dried chlorella) combined with other traditional daphnia culture feeds (like ground split peas, paprika, and active bakers dried yeast) gives high production of daphnia at a moderate cost. The hobbyist can therefore select from using very low cost feeds and be happy with low and slow production, or can add value to the feed with an addition of spray dried algae. Adding spray dried algae to daphnia cultures one can realize at least a 3.7 fold increase in production. Dried algae products come with other benefits. These products are far richer in vitamins, anti-oxidants, color enhancing phyto-pigments, and the proper fatty acids necessary for proper development and health in fishes. Therefore I would advocate adding dried algae products just for these added values without even considering price. I also tested, in subsequent trials, the suitability of adding other finely ground plant products to home made daphnia feed. This grew from the annoying, labor intensive activity, of purchasing dried split peas and grinding these into a flour like consistency using either a blender, food processor, or coffee grinder. Some hobbyists have avoided this step by using canned, human baby food vegetables (peas) purchased in jars from the grocery store. Some substitutes tested and found to be very effective were whole wheat flour and soy flour. These two ingredients can be exchanged for ground split peas or added in addition to the later. Paprika is still used since it’s very high in anti-oxidant pigments and is converted to color enhancing xanthophylls (carotenoids) in the daphnia which are then passed up the food chain to your fish. Finally, in the last twenty years there has been a huge growth of knowledge in aquaculturing a host of marine and freshwater fish and shellfish. Along with this growth there are now numerous dried, live, and preserved algae products available which all could potentially be used for daphnia feed. Some of these products are very expensive, some available to hobbyists, some not so readily available but with effort could be acquired. Many of the more expensive products have very great potential to increasing the nutritional content of your daphnia fed to your fish. I will only list some of these products here for your potential experimentation. Including but not limited to Artificial Plankton Rotifer (APR), Microfeast (Provesta), Spirulina (Ocean Star International), Chlorella (Now Foods), Algamac 2000, Algamac 3000, Algamac 3050, Aqua-grow Advantage, Aqua-grow Advantage Enhance, Beta-Meal, Phyto-feast and Roti-Grow (Reed Mariculture). I hope this helps for anybody wishing to venture into daphnia production or who have had troubles in the past. Daphnia culture can be reduced to science, although for many it may still seem like magic!